When Grandparents, moms and dads bring their children to see the West Texas Rattlesnake Show, they are making exciting, joyful, and thrilling memories that will last a lifetime. Years ago, my Grandfather told me that when he was a little boy, his father took him to see Buffalo Bill's Wild West Show. I always loved hearing those stories and Grandpa loved sharing the memories. 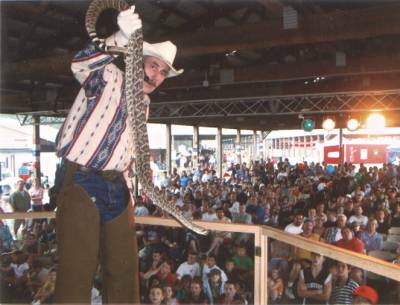 Understanding this, the goal of the rattlesnake show is to see that audiences are delighted with each and every exciting, educational, and entertaining performance of my thirty minute show.